The objective for this course is for the attendee to leave with the knowledge of how to recognize an ultrasound case, incorporate ultrasound into their practice, and how to create a study for someone to interpret, of the five main abdominal organs. This will be accomplished through learning the basic knobs necessary to create a diagnostic image, how to tweak that image with these knobs, do measurements, and follow a scanning protocol. Recognizing artifacts will be covered, as well as how to quickly assess a trauma case with ultrasound. 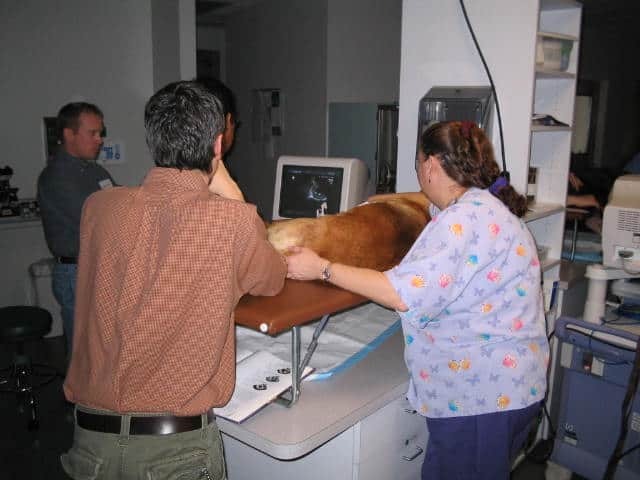 This is a great veterinary ultrasound course as well. Hands-on scanning will reinforce the didactic portion, and recognize normal tissue. Attendees will earn 14 RACE approved CE credits. Room reservations must be made individually, and are on a first come/first serve basis. This is a busy hotel, so we advice you to reserve your room when you register for a class. Reservations must be made to guarantee availability. To receive our corporate rate please mention WAVE when registering. Please Join our mailing list to be notified of Small Animal Training courses.